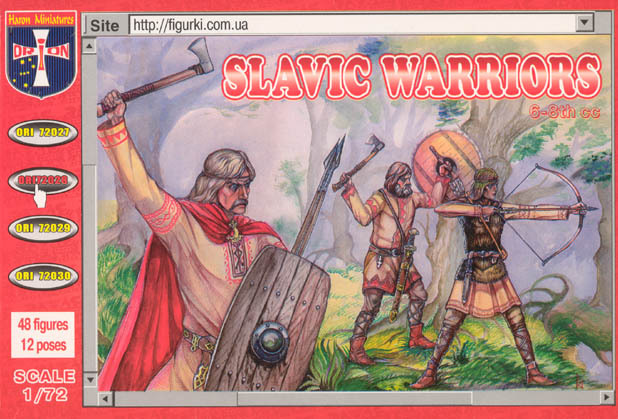 Today we talk about.... the Slavic Warriors from Orion, a very important faction from the Dark Ages, with plenty of uses. But is this a great set that will fill a huge hole in history, or rather 48 scruffy looking men that leaves a lot to desire? Discover it in this review! They are nicely sculpted, as Orion nearly always does. The anatomical proportions are good too. The problem comes with the moulding, as some examples have lots of flash, which is very difficult to remove due to the nature of the plastic used, and because instead of a big blob of flash, it is small sparks of flash all round the figures, which makes it very tedious to remove. Some examples don't have any flash (mine is quite good), but you can see in the pics how it is quite present, and by my experience with other Orion sets, if you get a bad one it diminishes the overall quality of the set. 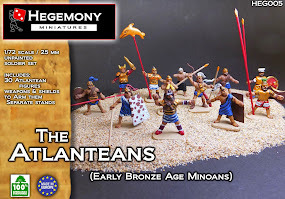 The spears are pretty bad, I have seen worse (like the Early Byzantine infantry), and at least you will have the temptation of replacing the spear in one of the poses. Finally, the third man on the first pic, I think it is depicting a slinger (no, he isn't a Indian waving a freshly cut head of hair). He has a very unusual pose, and the sling doesn't seem a sling, nor does it seem that it contains a rock. You probably be better off cutting it off and replacing it by another weapon. This is strange as Orion has done previously other slingers finely. It seems the sculptor couldn't make his mind if make a slinger or a another axeman, and finally he got the pose of the axeman with something similar to a sling. The poses in general are not too conventional, which is very welcome when you have a lot of soldier sets. Orion has done it's homework. They represent perfectly the Slavic Warriors. I couldn't be happier with the representation, it is exactly as I expected them to be, and they fit all historical depictions. If we extract some square shields, and change a bit the heads/hats, you can have a generic european/eastern european standard army from 400 a.c. until 1000 a.c.
With these figures you will have excellent figures for Germanic factions from the time of the Fall of the Roman Empire. You could transform them into early Baltic Tribes, use some as early Lithuanians, and of course as from all early Slav kingdoms. 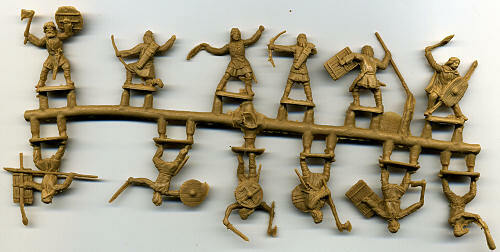 Some of the figures such as the bowmen could fit as peasants for Medieval Russian and Scandinavian kingdoms. They represent very well the subject, but they are completely lacking a leader. They don't have any fun addition, everything is a bit flat, you would need to make conversions and take figures from other sets to represent heroes, priests, leaders, etc. At least the figures seems fierce, and the man with the big club is very nice. The archer standing, seems, at least from my first impression of the artwork, to be a woman. She(? )is slimmer than the rest, and she has long hair, but looking again, and as Orion doesn't say anything, probably she isn't. 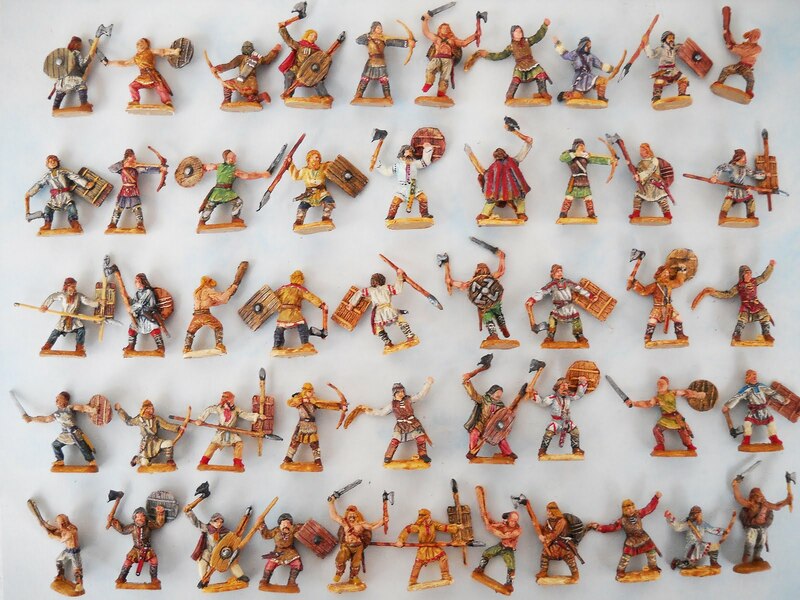 They have a good ratio of different men, skirmishers, archers, slingers, axemen, men that could be used as Berserkers... but it lacks unique figures, or simply a repeated example of leader, sub-leader, musician, etc. 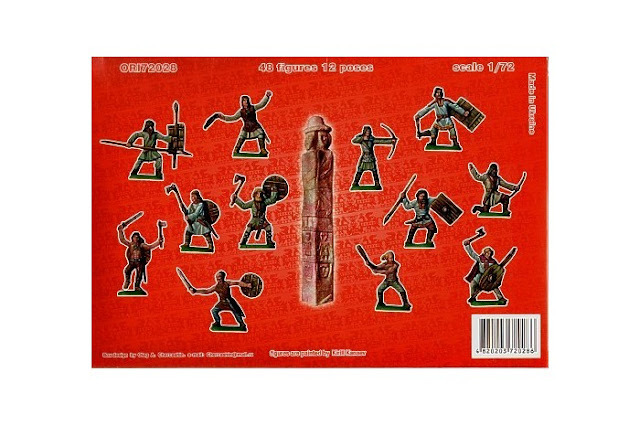 Their average cost is 10 € shipped, which is fine for a quite new set depicting a completely new subject. It is a fair price really. Please make a click on the eBay listings to help support this site. 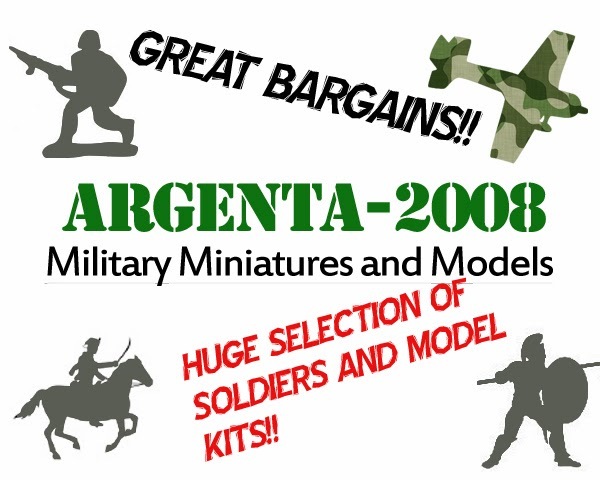 If you plan on buying them, I will be very glad if you could do it through this ad, as it will help me improve these reviews by buying a new camera, new sets and paints etc:) . The plastic is good both to paint and to glue, but you will have to completely remove all flash, and you could think it's not a big deal, but believe me, when you paint you need a figure completely flashless, and to achieve that it will be complicated. This is a notable set, and depicting a subject so important, and never made as it is, for me it is absolutely a must. I bought them right when they appeared from eBay. Some collectors if they are not too much interested in this period will not consider them so important, but I believe that in this world of miniatures so centered in famous subjects, having completely new factions not made before and that are not easily represented with other existing sets, the choice of Orion is praiseworthy. Thanks for the information, it is very interesting. I wish Orion would have given a plastic version of it!